BBC Weather has warned heavy rain and strong winds will hit Britain next week as a weather system moves in from the south-west. The UK could even be hit by snow as the weather system crashes into the colder air over the Pennines or the higher ground in Scotland. 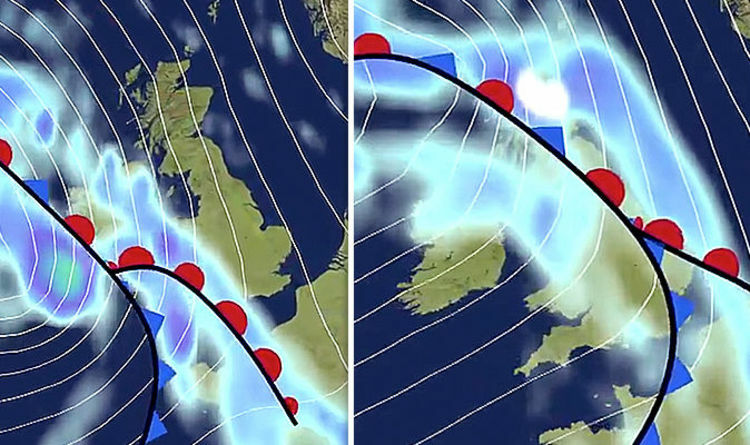 According to the latest BBC Weather chart, heavy rain sweeps across Britain on Tuesday. BBC Weather forecaster Alina Jenkins said: “A blustery start to Tuesday across Northern Ireland, Wales and southwest England. “All of this will be working its way eastwards as the day wears on and as it bumps into the colder air, we are likely to see some snow, not amounting to much, over the Pennines and higher ground of Scotland through Tuesday afternoon. “It’s a windy day, particularly for western coasts, these are average speeds but the gusts are likely to be much higher. “Temperatures still 6C or 7C the further east you are but that milder air will arrive from the west and that is a sign of things to come for the week ahead. The BBC Weather outlook for Tuesday to Thursday reads: “From Tuesday, the weather will turn more unsettled, with a front moving in from the south-west bringing widespread rain to most of the south and west. “Wednesday looks like seeing some potentially very windy weather with further outbreaks of rain, particularly in the west. The Met Office also warns of unsettled conditions next week as the milder weather system hits Britain. The weather outlook for Tuesday to Thursday reads: “Turning more unsettled across all areas with heavy rain or showers.